As the name suggests, “Navaratri” is formed by two words i.e. “nava” (for “nine”) and “ratri” (for “nights”). 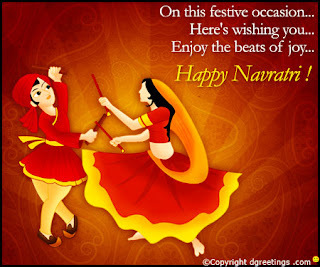 So, Navratri is a 9-day festival observed in the Hindu calendar. It is celebrated two times during an year: one at the beginning of summer, and two at the onset of winters. The latter begins with the day of Ashwina of the bright fortnight. Seeds are sown, sprouting is observed under the blessing of the planets. The festival is celebrated twice a year because we thank the Almighty for maintaining the balance in nature. Many legends are attached to this festival; all are related to Goddess Shakti and her many forms. The festival holds a special importance to Gujaratis and Bengalis; they celebrate the occasion with great fervor and enthusiasm. Raas Garba is the major attraction for tourist in this season. Dandiya (a form of Raas Garba) is jovially played by men and women during the Navratri. Navratri is a festival of Goddesses. Just as the child looks to the mother for power, we the earthlings look up for our Goddesses as they are the source of power. While the first three days are dedicated to Goddess Durga, the Warrior Goddess, the next three days celebrate Goddess Lakshmi, Goddess of wealth and prosperity. The last three days worship Goddess Saraswati, Goddess of knowledge. 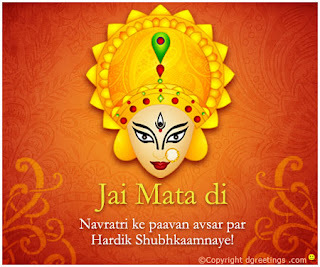 Thus, Navratri offers an invocation to Goddesses for a healthy and happy life. In certain traditions, a way of celebrating Navratriincludes observing fasts that breaks on the Mahanavami. On Mahanavami, people prepare delectable sweets and make an offering to nine young girls; representing the nine avatars of Goddess Durga. The tenth day marks Vijayadashami, or what is popularly called as Dusshera.